The international food aid organization Oxfam, recently the subject of controversy for its condemnation of Scarlett Johansson's appearance in a SodaStream advertisement, has a page on its website devoted to promoting Cynthia McKinney. The page, which is headlined "Ms. McKinney is one of those old school social activists that sorely seems absent today", defends McKinney's "9/11 Truth" views, repeating her charge that President Bush knew in advance about the 9/11 attacks, and says she was driven from office for saying this. It goes on to state that President Bush and Prime Minister Tony Blair were convicted of war crimes by a people's tribunal conducted in Malaysia by a group headed by former Malaysian Prime Minister Tun Dr. Mahathir Mohamad, of whom the statement says that McKinney is a follower and supporter. It also praises McKinney's support for the regime of Muammar Gaddafi, and condemns what it describes as "the U.S./NATO/Israel aggression against the Arab Jamahiriya state". In December 2008, Cynthia made international headlines when the Free Gaza boat she was aboard was rammed by the Israeli military as she was attempting to deliver medical supplies to the people of Gaza during Israel's Operation Cast Lead. Cynthia and her fellow humanitarian activists, rescued by Lebanon, never made it to Gaza. In 2009, Cynthia attempted to reach Gaza again, this time armed with crayons, coloring books, and school supplies for the children. She and her fellow human rights workers became the Free Gaza 21 after their boat was overtaken in international waters by the Israeli military and they were kidnapped to Israel. Cynthia spent seven days in an Israeli prison. And again, Cynthia did not make it into Gaza. Finally, Cynthia entered Gaza by land in July 2009 with George Galloway's 250-volunteer-strong Viva Palestina, USA. 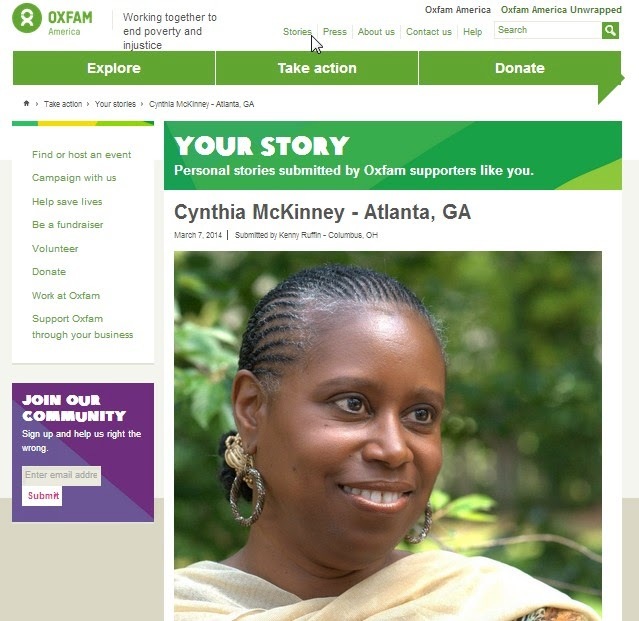 Oxfam's Cynthia McKinney webpage is included in a section of the website called "Your Story", which is billed as "personal stories submitted by Oxfam supporters". Its text is virtually identical to that found in promotional material posted on McKinney's congressional campaign website. I really do admire CM for her stance on Palestine. She knows that 911 was an inside job, so that is definitely a plus point, and on CNN after the flotilla she was on was attacked she requested that people remember Israel's intentional attack on USS liberty, one of the rare moments when the press was forced to even mention that tragic event. So she has 2 thumbs up from me. Glad you mentioned her. The most offensive BDS campaign graphic yet?